Classic and comfortable, these men's work pants are made of heavyweight washed duck. The fabric is washed down, giving it a quicker break-in time than our original duck. The pants feature multiple tool pockets, including back pockets that are reinforced to prevent blow-out. They're cut for a relaxed fit through the seat and thigh, with a straight leg opening that fits over most boots. Machine wash warm like colors. Do not bleach. Tumble dry medium. 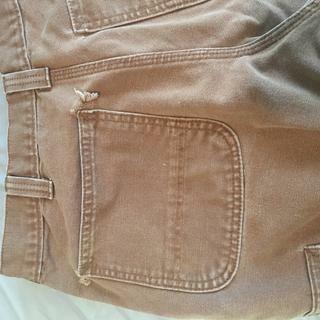 Ehh, too easily rips at back pockets. Had a few pairs of these pants for over 2 years & wore great.. bought 3 pairs within the last 3 months & all 3 have torn on the back pockets. 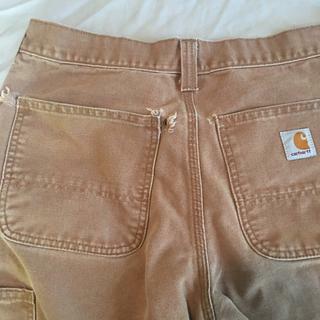 I use to swear by carhartt work pants, but I am not second guessing myself. Maybe it’s just specific to these pants. I've worn these pants regularly for over a year and they hold up well in the shop or on a site. They just keep getting more comfortable. I'm buying more right now. I bought these as a replacement to the Men’s Ripstop Cellphone pants. They are a little bit heavier and the cellphone pocket is just a bit tighter, but for cooler weather I believe they will work well. I still would rather have the Men’s Ripstop Cellphone pants as well as the ones they made in a lighter weight for summer time wear. These used to come with a hammer loop. I love the pants, and have bought a handful of them over the last 15 years. When I purchased a new pair recently, the hammer loop was gone. Some of us liked your all-cotton heavy duty duck fabric, and actually do need to put a hammer in the loop from time to time. So when I went to get a pair with double knees, thinking surely the hammer loop would still be there, I was doubly disappointed to see that you've discontinued them altogether. I like the relaxed fit - loose enough to work in, but not super baggy. Please keep selling clothes for people who work, not who like your brand and never get it dirty. Really like the fit. They don't sag. Great Quality and they last forever. I will never buy anything other than Carhartt for work because I know it won’t rip or tear. I would give it 5 stars. I love Carhartt any way. I loved my pants when they arrived. Just wish that our “local” Carhart establishments carried the relaxed fit pants or that they could order them for me and have them shipped to their store. But I was told that they could only sell what they had and wouldn’t order me what I needed that I had to do that myself. But that being said, I did like my pants. I was at first concerned about the size of the pocket for my cell (G6). It's width is perfect, though less than an inch sticks up over the top. They look great with the classic Carhartt brown and fit. So far they feel great and wear nice. I'll buy them again, and maybe the blue jean version. I have about 4 pairs of these, love 'em. It does make me laugh that what is marketed as a 36" inseam is closer to 40". No joke, this is often the case with Carhartt. I'm 6'6" so always get 36" because their 34" is slightly too short. In this style the 36" will still cover half of my foot so they usually require tailoring. Otherwise, these fit great, make the caboose look stellar. I am 5'11" tall 160 lbs. Fit. The Relaxed fit works much better than Traditional fit for me. I was concerned about "washed" but fabric comfort is 100% better than unwashed and no noticable loss of durability. PS. if you want your boss to fear you, they are easy to iron / crease. Thank you for taking the time to write a review. We appreciate your feedback and have sent your suggestions to our Product Design team. We appreciate your kind words and are happy to hear that you are pleased with your pants. Thank you for choosing Carhartt. They seem to be good pants. They won't get worn much, since they're too big. Only when I'm really sick of wearing double-front pants. A 29 waist is perfect for me. Since the smallest these come is 30, they're too baggy around my waist, so they aren't as comfortable as they could be. But for work when I need to be a little more dressy, they'll do. Would be nice if they were offered in smaller sizes though. We appreciate your feedback and have forwarded your suggestion to our Product Design team for future consideration. these run more true to size than the denim jeans that I've had from carhartt. Plenty of pockets and loops for everyday essentials. Just a very good pair of work dungarees. These are becoming my "go to" pants!! Carhartt has reached out to the customer directly to ensure satisfaction. I had three pairs of these for about four years. They eventually wore out, so I bought three more pairs. Four years is pretty great work life I think. I don't work in the harshest of conditions but still, any pair of pants lasting that long is pretty fantastic. It also helps that the fit is perfect. I love these pants. These are the pants I've been looking for from Carhartt. Would love to see more color options. are these about the same fit as the b361? BEST ANSWER: The 101710 and the B361 will have a similar fit. They are both Relaxed Fit with a straight leg opening. 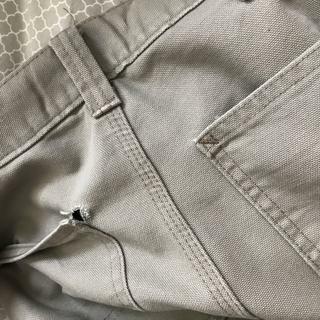 All of my Carhartt pants have the same fit at the waist and hips. I only have relaxed fit, but many different styles. Hope this helps. Why discontinue yet another popular style of pant? Are these pants being discontinued? BEST ANSWER: We apologize, but this pant is being discontinued. Looking for Gravel size 32x36. Do you know when more might be available? BEST ANSWER: This style has been discontinued. We do not expect to receive any more stock. What happened to the green pants in this style? I have bought them before and very disappointed that they are no longer available. BEST ANSWER: We apologize that the Moss color is no longer available. We will share your interest in that color with Product Design as a suggestion. Is gravel color dark grey? BEST ANSWER: This style is made in the US, Mexico, Nicaragua and China. I need 31x32 size for the "moss" color option, but it's sold out. Could you tell me please, will be this color and size available soon, or maybe it's discontinued already? Thank you. BEST ANSWER: We apologize, we do not expect to replenish stock of the Moss color since it has been discontinued. When will you offer these pants in blue? Navy blue or Petrol blue, doesn't matter. What are you waiting for? BEST ANSWER: We apologize that we do not have any plans to offer them in those colors at this time. We try to keep our colors to a minimum. We have forwarded your request to our Product design team for future consideration. BEST ANSWER: It ranges from 17" circumference in a 30" waist, up to 21.5" around in a 48" waist. Does the tool pocket fit a typical cellphone? BEST ANSWER: Yes, I have a iPhone 6s and it fits perfect in the right side diagonal tool pocket. As the Samsung S6 owner mentioned, the right side straight tool pocket is not quite deep enough (I put my ID/credit card wallet in this pocket), and the left side tool pocket is a little too narrow. I have a samsung S6 and it doesn't fit width wise in the left tool pocket. It will fit in the right side width wise but it isn't deep enough to hold entire phone. Unfortunately that only leaves the regular pockets. I hope they address this, I'm sure its a common problem. Yes, I have an iPhone6 and it fits nicely in the side tool pocket. If you have a cell phone that is much larger than that it may not fit. The iPhone6 is a nice snug fit. My phone (a Motorola Moto E LTE) fits in both side pockets. Are they offered in a 29" waist? BEST ANSWER: The smallest waist size in this garment is a 30." are they baggy at the ankles? BEST ANSWER: This style features a straight leg opening meaning it is wide enough at the bottom to go over boots. No. They're a little tighter around the ankles. The picture is pretty true to how they fit. Are they baggy ? If so what style do you have that is not baggy at the ankles. BEST ANSWER: This is a relaxed fit pant with a straight leg opening. In our menswear, the relaxed fit is a little closer to the body than the loose/original fit. The leg opening measurement actually varies by waist size. It is 17" in a 30" waist, and 21" in a 46" waist. This would not be a baggy pant on most people, but it depends on the build of the person wearing it. Please feel free to contact Customer Service for specifics. will you be getting these in petrol blue ? BEST ANSWER: We apologize we do not plan to add Petrol Blue this year. We will forward your suggestion to our Product Design Team for future consideration. Do these have a coin pocket? BEST ANSWER: Yes, our Style 101710 has a coin pocket at the top right corner. Yes. Coin pocket in front right pocket. Also has a nice sized cell phone pocket. If you mean a pocket-watch pocket, yes. And it's relatively big.